Please click here to sign a Change.org petition calling on the Silicon Valley Community Foundation (SVCF) to end its financial support for CAIR, Islamic Relief, and other Islamist hate groups. SVCF officials Manuel Santamaria (left) and Mari Loijens at a December 9 banquet organized by the Council on American-Islamic Relations (CAIR) in San Francisco. In gleeful tweets, officials Mari Loijens and Manuel Santamaria from the Silicon Valley Community Foundation (SVCF) — America's largest community foundation, with assets of over $8 billion — documented their attendance at a December 9 banquet organized by the Council on American-Islamic Relations (CAIR) in San Francisco. This sordid history of hate, however, has not concerned SVCF. 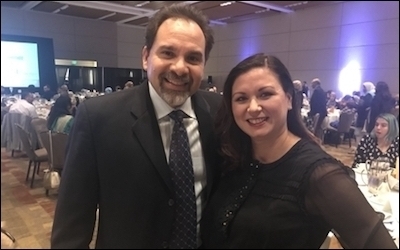 Loijens and Santamaria attended CAIR's banquet to accept the "Empowering American Muslims" award from CAIR for SVCF's "bold defense of and support for their American Muslim grantees in the face of Islamophobic attacks." Loijens tweeted after the CAIR banquet: "Thank you, CAIR-SFBA for all you do to help our community come together and build bridges." What exactly, then, were these "Islamophobic attacks"? Since 2008, SVCF has donated over $330,000 to CAIR and Islamic Relief (IR). The Middle East Forum contacted SVCF in 2016 to explain that far from building bridges or empowering Muslims, these donations support fringe Islamists whose regressive views — on everything from homosexuality to women's rights — create divisions in the American Muslim community and disempower ordinary, mainstream Muslims. Although the campaign included pleas from congressmen and a letter from 17 progressive Muslim leaders, SVCF still refused to listen. In fact, SVCF subsequently reiterated its support for CAIR and labeled the Middle East Forum as "racist" and "Islamophobic," while extolling itself as a "champion of diversity and inclusion." The absurdity of SVCF's position was revealed at the San Francisco banquet. 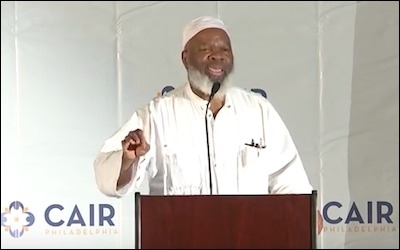 For all SVCF's talk of diversity, inclusion, and combatting bigotry, its officials didn't bat an eyelash when Siraj Wahhaj, one of America's most extreme hate preachers (and a former member of CAIR's advisory board), took the stage as a keynote speaker. Siraj Wahhaj addresses the Philadelphia chapter of CAIR in 2012. Wahhaj was named by federal prosecutors as an "unindicted co-conspirator" in the 1993 World Trade Centre bombing. Since then, he has long been outspoken about his hatred of homosexuals, non-Muslims and women. Wahhaj once preached, "I don't believe any of you are homosexual. This is a disease of this society." In the same sermon, he insisted, "The so-called feminist movement, many of them are headed by lesbians. They will have you hating men...we want our women back to their natural place." He even went so far as to say, "And you know, brothers and sisters, you know what the punishment is, if a man is found with another man? The Prophet Mohammad said the one who does it and the one to whom it is done to, kill them both." In another sermon, Wahhaj intoned, "Woe to the Muslims who pick kafirs [non-Muslims] for friends...Kafir will take you away from the remembrance of Allah." The word in Qu'ran, zina, means either fornication or adultery. If you commit zina and you're single, the punishment in Islam is 100 lashes. If you commit zina and you're married, the punishment is death by stoning—capital punishment...Allah is angry at you when you steal. He sees you. Punishment, chop off the hand. He's angry. When you drink, Brother, punishment? Lashes. You take drugs? Punishment? Lashes. So, Allah is angry. Punishment for adultery, zina, brother? Serious. Death by stoning. In its haste to demonstrate its anti-"Islamophobia" credentials, SVCF has actually proven the Middle East Forum's criticisms. SVCF has now shared a stage with the very extremism it denies funding. SVCF has now shared a stage with the very extremism it denies funding. It has embraced hatred, and betrayed those moderate Muslims whose pleas this enormously wealthy foundation ignored. We have got to get to the root of the problem, and we need to be absolutely clear on where the origins of ... these terrorist attacks lie. That is the existence of an ideology, Islamist extremism. We should be equally clear what we mean by this term, and we must distinguish it from Islam. Islam is a religion observed peacefully and devoutly by over a billion people. Islamist extremism is a political ideology supported by a minority. If SVCF truly wants to be a champion of diversity and inclusion, it must end its support for the "root of the problem." SVCF must work with truly moderate Muslims, and stop offering money and credibility to those who would stone women to death, persecute homosexuals and advance an ideology of hate. Samantha Rose Mandeles (@SRMandeles) is a coordinator at Islamist Watch, a project of the Middle East Forum.